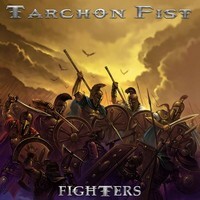 Second full-length CD of this band from Italy, Tarchon Fist!!!! And 2nd full metal attack!!! This band, born from the ex-Rain guitarist Lucio Tattini, reaches his goal also with their second CD Fighters, presented also with a bonus disc with some live tracks, alternative versions, the marching-in song for the Warriors - American football team of their hometown Bologna -, and videos.... At the price of only one CD!!!!! This optical disc, that starts with the anthem We Are The Legion, is full of very nice songs that cover all the kind of our favourite music: ballads, ruffian chorus, metal anthems and more!!! And there's also some special guests on this nice CD: ex-Primal Fear guitarist Tom Naumann (solo on The Game Is Over) and Tygers Of Pan Tang current members Robb Weir and Dean Robertson (solos on Still In Vice). If you want to make a journey into the land of heavy metal, please let Tarchon Fist drive you and I'm sure that you'll like it!